There was less a Crunch and more a munch about these thin Crisps. They did not last long before the mush stage set in. These were relatively traditional thinly cut Crisps. The colour was a gentle pale yellow. There were regulation oily patches and blisters. There was also a smattering of tiny green flecks which would presumably be the Chive. A Nose Plunge Test revealed a certain Cheesy aroma that lacked in herby smells but certainly made up for it in warmness. 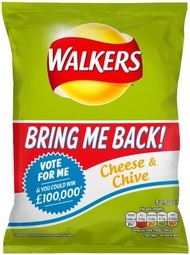 The question Walkers posed with this flavour was “Should it return” to their mainstream range. Compared to the other flavours: Beef & Onion, Marmite, Barbecue, Lamb & Mint and Cheesy, it is a no brainer. Cheese & Onion is a vital member of the British Crisps armament. Cheese & Spring Onion is also very popular. Herbs and Spices are a key modern ingredient and Chive compliments the Cheese very well. However, the conundrum poses a secondary and more important question for us at Chips & Crisps – is it good enough? Well, you cannot compare it to many peers because it is surprisingly unique in its flavour combo, but you can consider the strength of the two ingredients. The Cheese overwhelms the Chive, but it is clearly present nevertheless. However, it’s not quite as good as it could and possibly should be.